ARTICLES: Serials Solutions -- The Law Library and Barry University's main library subscribe to many different databases that contain articles from thousands of sources in dozens of disciplines. Serials Solutions helps you locate the correct database in which to find the article. Books and treatises on ADR, arbitration, and mediation published by Thomson Reuters, West Academics, and other Westlaw-affiliated publishers. Barry Law students, faculty, and staff will have to log into their Westlaw accounts to access this resource. Books and treatises on ADR, arbitration, and mediation published by Bloomberg BNA, the American Bankruptcy Institute, Practising Law Institute, and more. Designed to guide the mediator, lawyer, advocate, student, and interested party who wishes to find an alternative to litigation. Provides solid guidance on how to resolve legal disputes and other kinds of conflict commonly encountered in mediation matters. 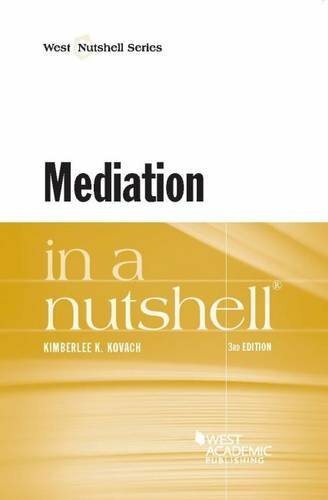 The book references a variety of ethics codes, statutes, checklists, and other helpful sources for beginning and seasoned mediators alike. Barry Law students, faculty, and staff will have to log into their LexisNexis accounts to access this resource. Now you can search for keywords (like "mediation") in an article title or in the main text or any combinations thereof.